Populous resorts, important archaeological sites, picturesque villages await us on the west side of the island. 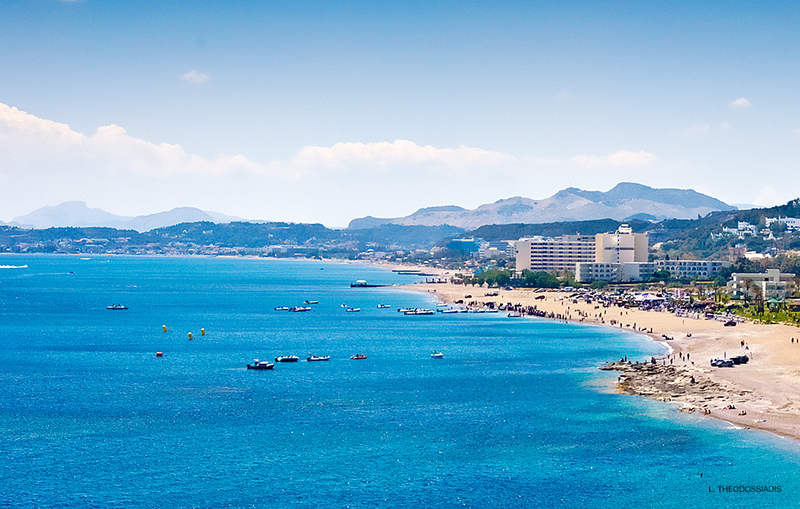 Following the road to west we cross the great coast of Ixia where the island’s Miami-beach style hotels are clustered and reach Ialissos (Trianta) at 8 km, a townlet surrounded by orchard. One should visit here the church of the Dormition of Theotokos (Virgin Mary, Mother of God) with its famous woodcarved temple, and then follow the winding picturesque road crossing the pine – wood up to the Acropolis of Ialissos (6 km) – the important Doric city built on the flat top of Mt. Filerimos, strategically overlooking the island. Places of archaeological interest include the temple of Polias Athena (3rd century BC), the Baptimal Font of an early Christian church, the brilliantly restored church of Panagia Filerimos, the monastery, the ruins of a medieval castle, the Doric fountain and the ancient necropolis. Further to the west on the coast road, after Kremasti and Paradissi, one should go up left and reach the lush greenery of the famous Petaloudes (Butterflies) valley (25 km), unique in the whole of Greece. Millions of butterflies gather here in the summer. The slightest sound drives them in flocks from among the trees and shrubs – a rare sight. 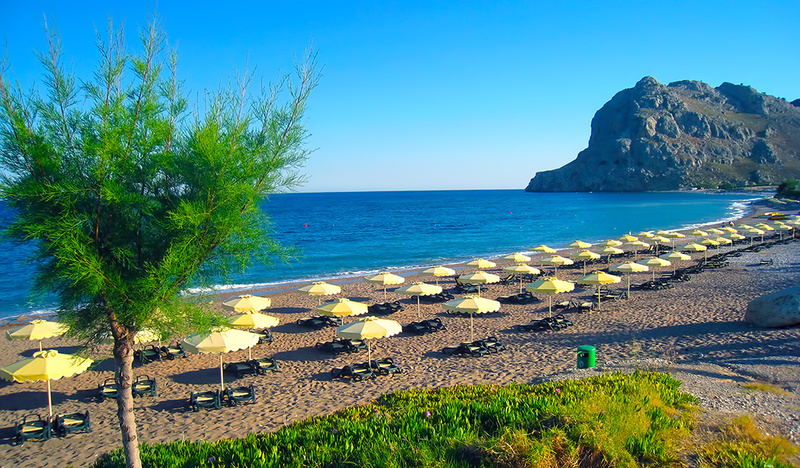 Returning to the coast road we reach the side – road leading to ancient Kamiros ¹, third in importance commercial center of antiquity (34 km). Archaeologists discovered this city, forgotten for centuries, in 1928. Ruins of this city – unique in having neither a castle nor an acropolis – are not commensurate with its past glory. We discern parts of houses and buildings, the Agora, with its Doric stoa (3rd century), a Hellenistic temenos with Doric temple, ruins of an aqueduct and remnants of the peripheral temple of Kamiriad Athena. Beside the foundations of that temple stands the Panagia monastery, near to a proto – Christian catacomb. 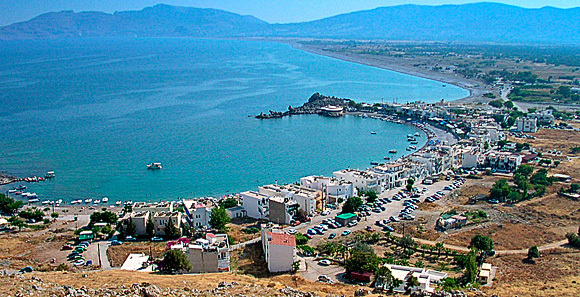 The west road continues for a while along the coast, reaches the village Kamiros-scala (51 km), then turns inland. From this village, with picturesque windmills and a panoramic view to the opposite islets, one can reach Chalki by caique. The traveler will be pleasantly suprised by the amphitheatric Kritinia village (55 km), with a nearby impressive medieval castle. The road winds south trough the forest to Siana (69 km), famous for its aromatic pine-sage honey and souma, full of old stone houses and a church with heavily restored eighteenth-century frescoes. 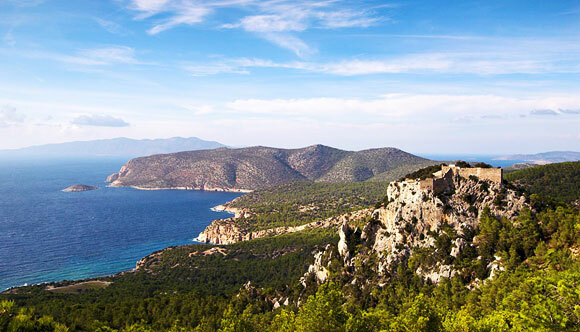 At a distance of 4kms lies Monolithos, built on the pine – covered slopes of Mt. Ataviros. A nearby medieval castle, built on a steep cliff, imposes its presence. To the south one crosses endless green fields to reach Apolakia (84 km), famous for its marriage feasts, and finally from the opposite side – Katavia (102 km).